Axial has released officially licensed 1.9 Maxxis Trepador Tires (AX12019). 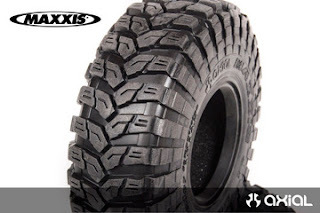 The tires come in Axial's R35 rubber compound. The aggressive tread pattern provides excellent traction on mud, rock, sand and everything in between, just like their 1:1 counterpart. These tires also feature a multi-stage staggered shoulder pattern providing improved control, even in the most difficult off-road terrain.